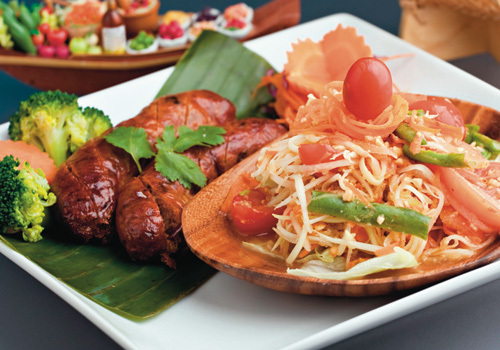 In recent years, Thai cuisine has become one of the world's favourite food. 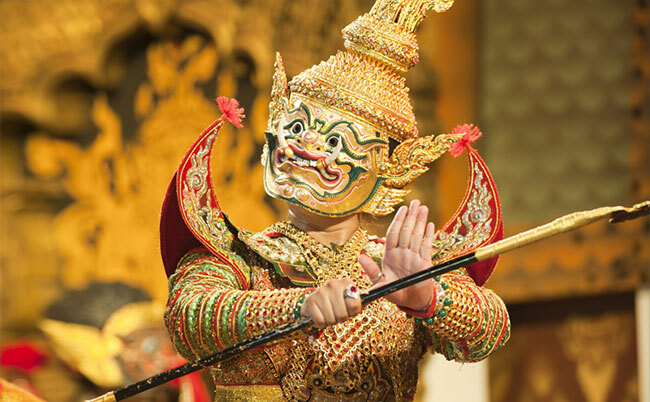 The style itself is a marriage of ancient Eastern and Western influences that has evolved into something uniquely Thai. The original traditional Thai cooking methods were stewing and grilling, but Chinese influences saw the introduction of frying, stir-frying and deep-frying, and Chinese merchants and migrant workers brought recipes from their homeland that were adapted into the Thai culture. Chillies, synonymous these days with Thai food, arrived in the late 1600s with Portuguese missionaries who brought them from South America. From India came curries, but instead of using ghee the Thais substituted coconut oil, giving a milder, creamier taste. Dutch, French and Japanese influences all crept in during the glory days of Ayutthaya. 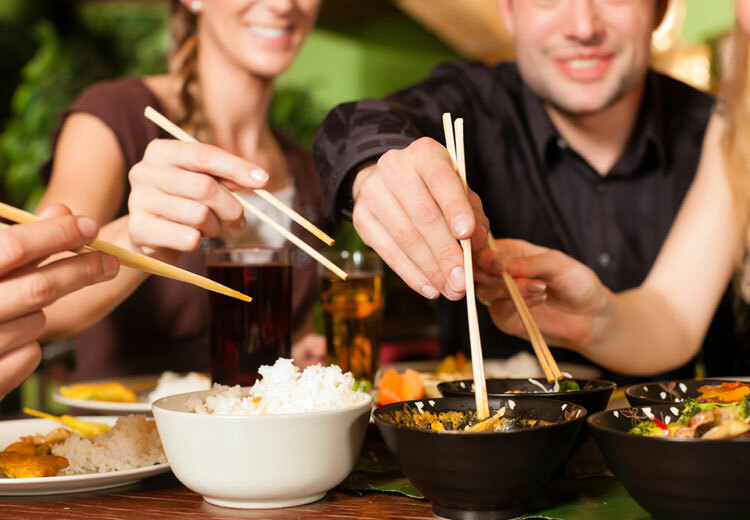 Thai meals are served all at once, allowing diners to enjoy complementary combinations of different tastes such as sweet with sour, spicy with plain, and liquid with dry. 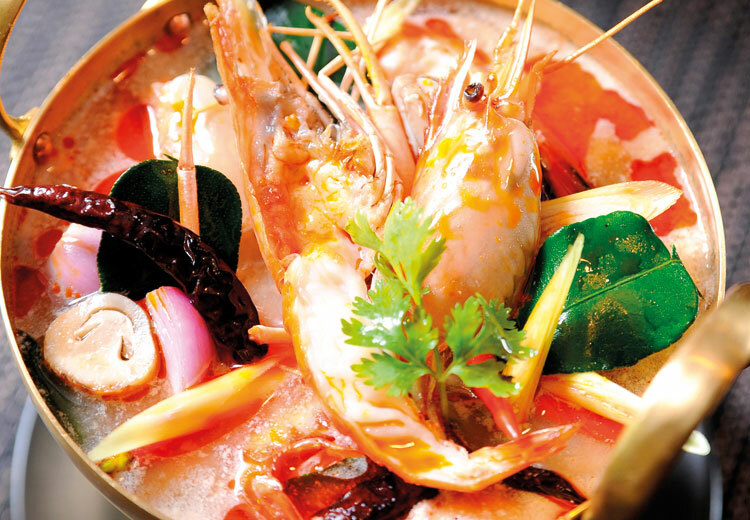 A typical Thai meal usually consists of a soup, a curry dish with condiments, barbecued, steamed or fried meat and fish with accompanying dips, and vegetables. The basis of the meal is rice. 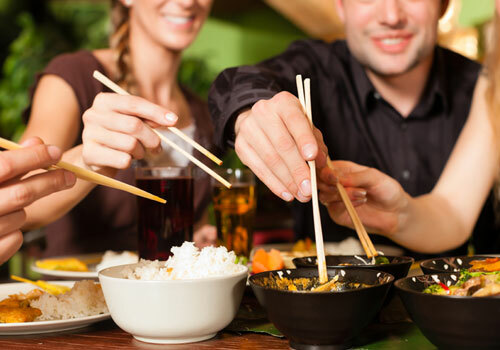 The food is eaten with a spoon and fork, chopsticks being used only for Chinese dishes such as noodles. Thai food is spicy, but not all dishes have chillies added. If spicy food disagrees with you, it is an easy matter to enjoy a full meal of plain dishes. Vegetarians have an excellent choice of food (known as "aharn jay"), because of the Thai Buddhist tradition. 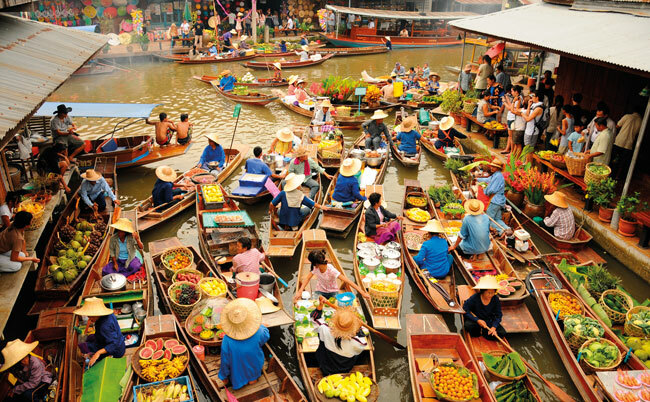 Long acknowledged as one of the world’s most famous culinary capitals, Bangkok is a gastronomic paradise whether you’re catering at a fine dining restaurant in a five star hotel, or at a humble street vendor. Food stalls on the streets are almost everywhere you look and they provide a wonderful mix of sights, sounds and smells. 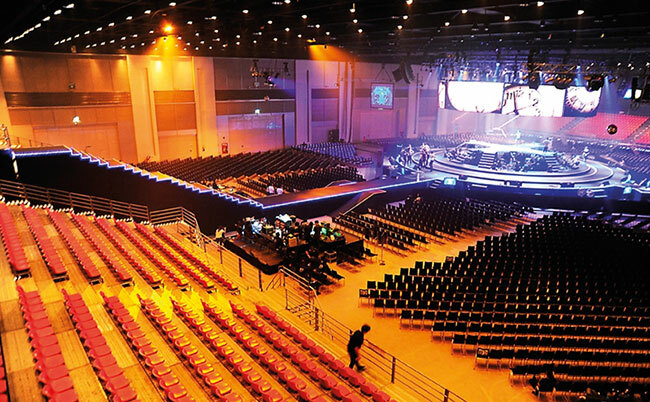 Many open around the clock and are small venues with either simple plastic chairs and tables right on the street or feature glass-fronts where guests sit inside. There are numerous kinds of noodle stalls available including chicken, duck, beef and meat balls. If you are not sure what you want, it is best to look at the ingredients on the preparation counter and point. Not all these places have menus and if they do, the list of dishes will be in Thai. Whatever you decide you will get real value for money, a great variety and delicious food and the convenience of knowing that when hunger pangs strike, you can fill up virtually 24-7! You are literally spoiled for choice but here are the top five recommended street meals. Try ‘Yen Ta Fo” noodles in red soy bean paste with fish ball, squid and morning glory. For a popular meat dish there is ‘Kao Mun Kai’ which is steamed rice and chicken. This is usually served with a variety of vegetables and dipping sauces, plus the inevitable peppers and chillies. There is also the famous ‘Tom Yam’ which is a spicy dish with a combination of healthy and interesting ingredients including stock, lemongrass, kaffir lime leaves, galalangal, lime juice, fish sauce and chilli peppers. Another favourite is ‘Kai Jiaow’ which is a tasty Thai-style omelette but unlike the western version, fused with a range of herbs, adding more flavour. 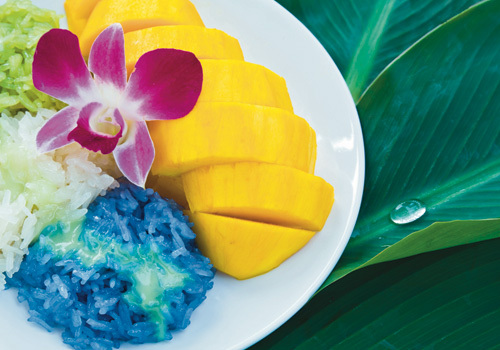 If you want a dish for ‘afters’ then try ‘Khao Niaow Ma Muang which is regarded as a classic Thai dessert. It is a great combination of mango and sticky rice pudding. 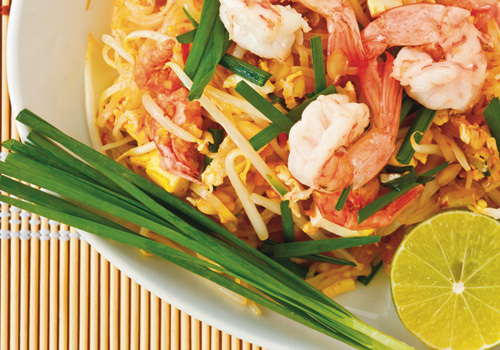 Thailand as a country boasts an enormous diversity of dishes wherever you travel. Head to the mountainous North with its cooler climate and there is a large range of roots, vegetables and herbs. Sour and bitter flavours dominate here and this is very evident in the soups including ‘Kaeng Ho’, a soup made with pickled bamboo shoots. Travel across the country to the North East into the region known as Isaan. Influences from neighbouring Laos and Khmer are strong. Glutinous, or sticky rice is the choice ahead of the usual white variety. There is a strong savoury taste to much of the food because of roasting and grilling. ‘Som Tam’ spicy shredded green papaya salad is the best known dish and sees the papaya pounded with a mortar with a host of ingredients including shrimp, garlic, fish sauce, lime juice and more. Another dish favoured by locals and tourists alike is ‘Kai Yang’ which is grilled chicken with added coriander root, black pepper and fish sauce which is rubbed over the chicken before slow cooking. 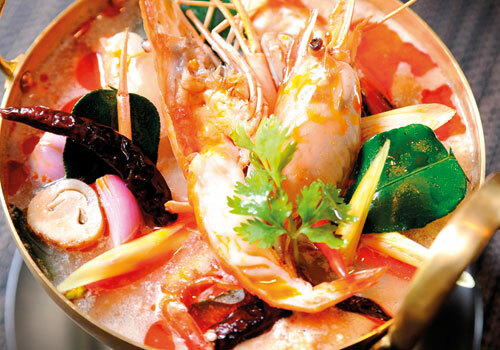 Although the metropolis of Bangkok is the dominating influence in the Central region, there are still many other food specialities that give this area its own character. The Chinese accent to the dishes is strong because of the large community living there. A particular curry is ‘Kaeng Khieo Wan’ which is a green curry usually with either chicken or fish. 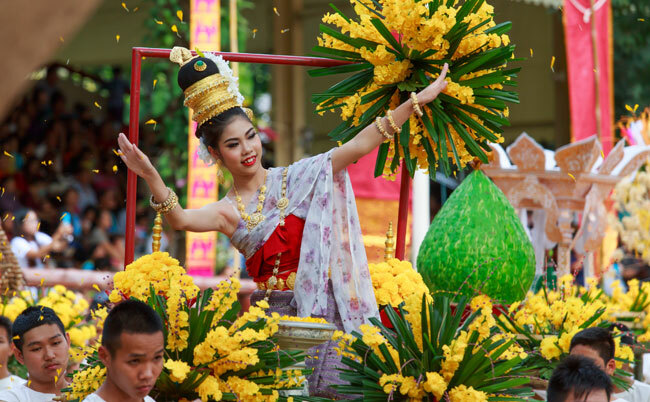 The South of Thailand is a potpourri of styles with Chinese and Malaysian settlers having a strong influence. This is in addition to the historical trade journeys from India and Java, each leaving their own culinary marks on the area. A typical dish for the south is ‘Kaeng Tai Pla’ which is a very fiery curry made with green beans, fish stomach, pickled bamboo shoots and potatoes. 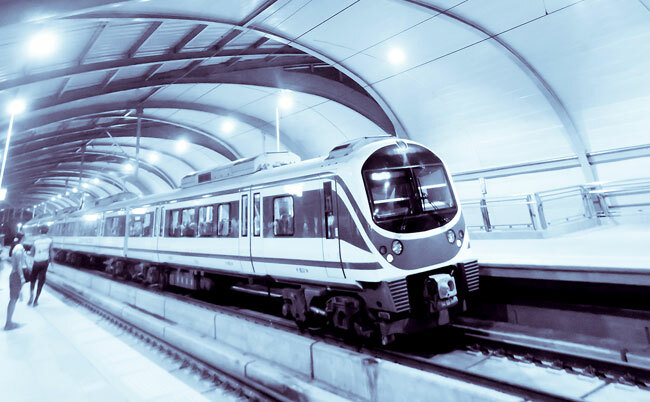 If you would much rather stay with Western food, you will find Western and other cuisines in every city, along with many of the world's best-known fast-food brand names.